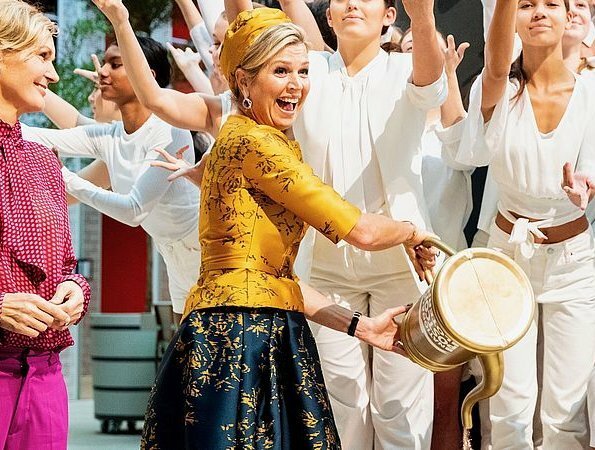 On December 6, 2018, Dutch Queen Maxima opened the new office building of Goede Doelen loterijen in Amsterdam, The Netherlands. 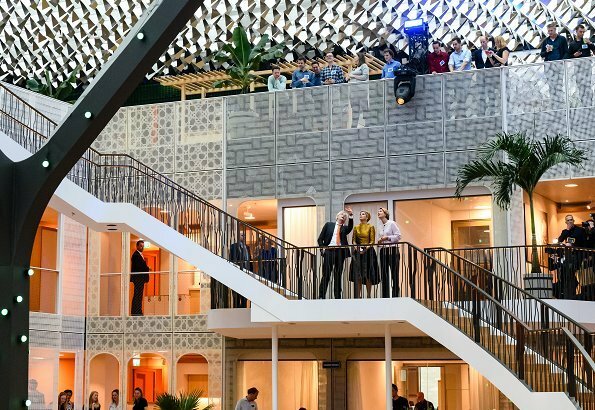 The renovated building includes a roof with high efficiency solar panels and the building also collects rain water for usage. 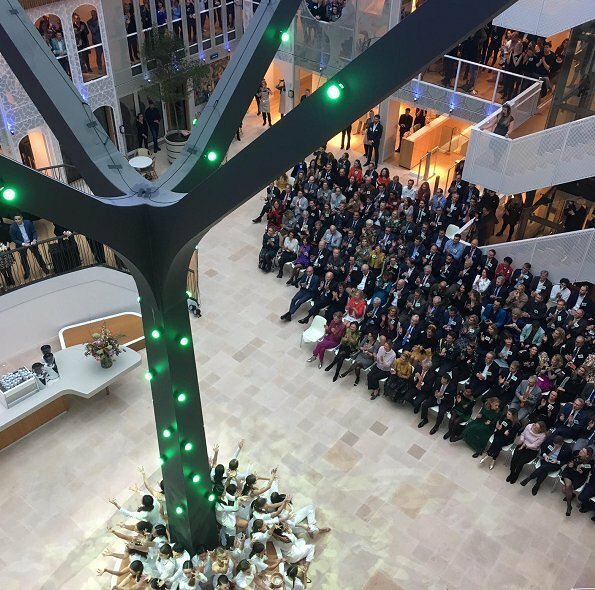 The building is also equipped with innovative windows that produce electricity. The charity organizations of Holding Nationale Goede Doelen Loterijen NV (Nationale Postcode Loterij, VriendenLoterij en BankGiro Loterij) are non profit organizations that raise fund for a fair and green world. Schön, sie wieder glücklich zu sehen. Today,I like everything on Maxima she looks great so is her hair makeup and of course the earrings. She’s such a joyful person, one feels like pinching her cheeks. Nice skirt, okay top, only good on maxima hat. Finally! A nice updo! I like the outfit, but the hat is a bit too much. 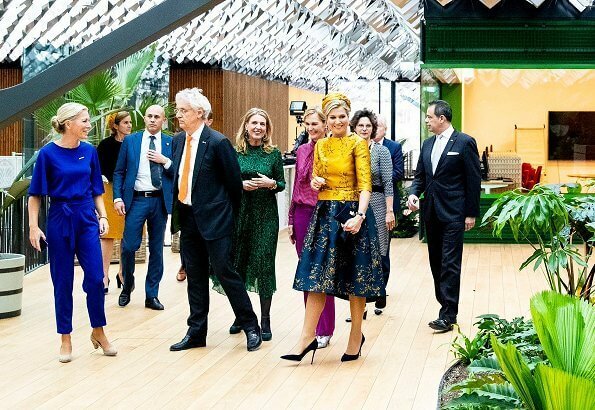 Maxima is looking very good and so the other women. She is such a beautiful woman! Her smile and happy personality are her best accoutrements. Today’s outfit is beautiful and those earrings are spectacular! She must be wearing Natan - shiny and so stiff it could withstand gale force winds or stand up on it's own. Yuck. Wow, absolutely stunning! Fit for a Queen! so wonderful, I love her style. She looks good, but I think she is overdressed. It would be a good outfit for a party, not to open offices. I agree. Clothes, character and charisma all rolled into one joyful package. You go, Maxima! Looking good - I like it very much. Interesting building as well! Innovative.